Greetings, I am Lord Sananda at your service; it is my Divine Pleasure to be here once again with each of you. We are accelerating the process, we’re stepping up the game, and we’re bringing in the frequency of Light at a much higher level of essence than we have done previously. I know each of you have heard about the story of Christine and Michael, and what they are going through, and what each of you are experiencing with standing up within your power, and now is the time to do so. This Power of Light that is yours, which is ours together, is beyond the comprehension of any other frequencies that cannot understand where each of us are in the pathway of the New Earth, and the pathway of allowing yourself to fully bring forth New Divinity unto your physical body and walk this pathway of acceptance as being a Lightworker; as being the frequency. We are here to assist you in that process; we are here to stand with you to allow you to see that you are not alone and we want you to feel it. We want you to allow it to be expressed within your Being. On a personal note, I want to share that the Dearest One here is being combated with great energies of many different levels, but what they don’t realize, which is happening to her in this moment, her power has grown stronger. The frequency of light from this point forward is beyond any comprehension of your thought processes. I ask of you to put your thought process of the mind aside along with putting your lower bodies aside. I ask of you now to bring in your Higher Self as you never have before) previously, to allow that activation to your Thymus gland, the Seat of your Soul; to allow your Highest Essence to create the Lightbody that is within you; to fully incorporate your Highest Presence in a frequency that is not of a physical essence yet, allow that consciousness to come onto you, and hold onto your seats, my friend. As I, Lord Sananda sit here within the body of Christine, I allow her frequency to combine with my frequency to combine the Source of Light energy in her full composition; so she no longer needs to be a warrior that is fighting, and allow her to be a Torchbearer that has allowed herself to come into this space, and allow each of us to share with each of you, so that each of you can become those Torchbearers. I honor her for allowing herself to be in this space. I honor Michael for allowing it to be also as he becomes the grounding cord for her in this moment. Now we bring in the frequencies in a different way than we have previously. I ask each of you to connect with your essences as you will be feeling waves and waves of light frequency that will expand within you through this process. In this frequency of Light that we are, we intuit the Source of Oneness in a new way than we have before; Divine Mother and Divine Father God are standing by with their message, and as Lord Sananda, in this moment I Am ready than I have ever been before, and this is the frequency of my I AM presence. I ask of you what is the frequency of your I AM presence in this moment? What is that you are incorporating within you, what are the waves of light that you are allowing yourself to feel and to see? This is the process that we are all about to experience. When Lady Meleriessee speaks of raising your vibration beyond the Mercury Retrograde, however that may be appropriate, because truly you are not of the planetary level any longer ~ you are not of the 3rd dimensional level, and now you are moving into the higher levels whether you are doing it in a consciously or physically, you are allowing it To Be. I ask of you not to question what it is you are feeling, allow your Self to just embrace it as that is the most important part in the Wave of Acceptance. So let us continue with the Wave of the Energies, I AM (Lord Sananda, the Spokes-Being for the Christ Consciousness; I Am All that You Are also. We are the Cosmic Great Central Sun of the Divine Mother and Divine Father God to bring forth this light. Allow yourself to just feel the frequencies that You Are as we impart unto you the Essence fully in the experience of your Acceptance of all that You Are. Allow this frequency of Light to be fully within you. Allow yourself to bring forth within your physical being the Highest Force of your Essence than you ever have incorporated before. Blend it down into your Physical Essence. I AM the Consciousness of the ONE! Feel the Power that you are! Feel the Essence that you are! Allow it to incorporate within you as it blends through your entire Being. Your Heart accepts it! The Essence That You Are. 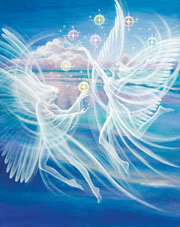 The Remembrance of the Essence of your Angelic Self slowly floats down from 144th dimension. We, as the Divine Mother and Divine Father God, have been created to bring forth these energies unto you, but there is so much more in the Oneness that we are together. Feel the essence of the 144th level come slowly down in your creation, comes down 144, breathe 130, breathe 120, breathe 110, breathe 100, 90 breathe deeply, 80, 70, 60,50,49 now we are at the Cosmic Level of the Divine Mother and Divine Father God . oh coming down,13,12,11,10,9,8, Earth energy, 7,6,5, we’re stopping at 5. Allow yourself to embrace the fluidness of what the fifth dimension means to you physically. What you are basically doing is allowing your I AM presence and your Higher Self to come into one Unification within your physical body, this is why the fifth is so loving, this why there is such a beautiful interaction. This is the essence that you are. We, of the Divine Mother and Divine Father God, are just here to show you the way. As we express to you, as we express to you this frequency, it is you, it is you, it is you! Feel this essence fully being in your physical body. Embrace yours across your Heart allow yourself to feel the Love that you are. Feel this Power and this Light as we do this together now. Expands diagonally, it expands horizontally, and not just vertically. The essence of the bubble of light around us completely goes around the Earth. Moving it into the Essence that we are, now sit for a moment and fully feel your I AM presence, your Higher Self in your light body, and deeply breathe and feel your Power. Feel your Inner Power in your Solar Plexus. Feel the Waves of Light coming to you. To and Fro, feel the Essence of the Crystalline Colors and all the Rainbows of Light because this is the beauty of what happens in your frequency. Breathe that down and feel it, feel the smile that is your Angelic Self, now imparts to you as he/she feels the blessing being in the physical body as never before. You look above and you see heavens and heavens of light, clouds and beauty because now your bringing it down into your frequency and you feel the bubble of light. Feel that essence that You Are. Let it expand it within you. Let that Essence be with you. Allow yourself the Power. Allow yourself the Strength. But first of all allow yourself the Beauty that You Are. Then no one, no one, that can ever take it away. So breathe these Essences onto you, into a part of your body that may be weak. We want to make sure your auras are strong and powerful. Breathe it in. ~ Breathe it in. ~ Breathe it in. Breathe it in as we are the Oneness. I Am, I Am, I Am Oneness. These are the words you fully need to bring into your essence. We sit in complete honor of each of you; and please know that this is just the beginning, this is just the beginning of our Essence onto each of us. Know that nothing can penetrate this essence that we bring forth in this moment, it is blessing as each of us awaken onto each other. Yes, consciousness is now remembering ~ consciousness is now aware. As we do these frequencies, it blends out into the hemisphere to assist and break away the lower to bring in the balance of all that we are together. Let us breathe! Let us breathe! We hold you in our arms, and in our Light, in the Essence that We Are. Know there is no power that is as great that is in each of us within each of us. We Are One, We Are One, We Are ONE! We are the Divine Mother and Divine Father God of the Cosmic Great Central Sun to fully allow you to feel this power we have to give together, and allowing this Frequency to blend beyond us unto the many frequencies of light. We are here always with you, we are here in each of your eyes, I AM that I AM that I AM. I AM One Being Of Light, One Source Of Creation. We, of the Divine Mother and Divine Father God of the Cosmic Great Central Sun, are so honored to be able to share with you this knowledge that we are in the reunion of all our spirits of Light! Blessings to each of you as these frequencies come fully within you. In the Name of Oneness, and All That We Are. So Mote It Be, So Mote It Be For All Of Eternity. This is Lord Sananda, once again. I don’t need to explain, I just want each of you to feel this frequency, because this is just the beginning. So open up your hearts to the own level of compassion, acceptance, and joy that is from your own Source of Beingness, and you shall aspire to the greatest part of your self. Stand up and show your Power. I AM in deep honor for this moment with each of you as I walk with you in the Oneness that I AM as you share the Oneness that you are unto each of us. I love each of you very deeply, and this is a moment in time. It is a timeline for each of you to embrace. I am the Spokes-Being of the Christ Consciousness for the Cosmic Oneness.